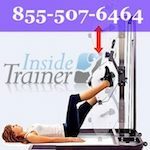 This is only a sampling of exercises you can do with the Resistance Chair System and I suggest you get the DVD’s they offer to go with the chair for a full range of exercises. 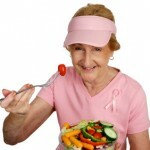 Remember to consult with your medical practitioner before starting a new fitness regime. Before you start, make sure you have all the safety features in place like making sure your Resistance Chair is in good shape, on a solid, level surface, and secure the cable anchor lock to the anchor assembly base. 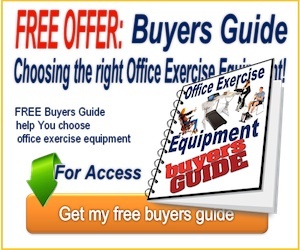 After you have looked at the Resistance Chair Strength Exercises on this page, go and check out more Warmup & Stretching Exercises you can do in your resistance chair. With your back firmly against the PostureProp Sit upright ™ and positioning the Resistance Anchor Cable™ under your arms – start with your hands at your shoulders (fig. 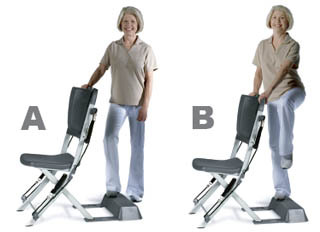 A), press out horizontally until your arms fully extended (fig. B – don’t lock out your elbows). Control your movement as you slowly return your hands to the starting position. Do this for 8 to 15 times. Keep your wrists strong and firm so you don’t bend them during the movement. This exercise works your triceps as well as your chest. Seated Overhead Press: This exercise works your shoulders and triceps. With a slight arch in your back, sit up straight and press your back against the PostureProp™ (fig. A). With your handsat your shoulders, press straight up with both arms until your arms are directly above your head and fully extended (fig. B). Again using controlled movement, return your hands back to your shoulders. 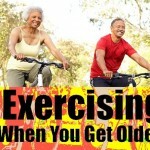 Do this exercise for 8 to 15 times. 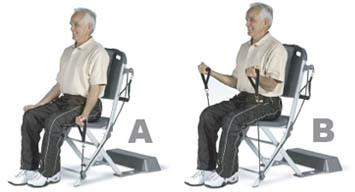 Seated Incline Press: This exercise works your upper chest and triceps. 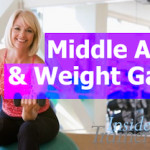 Sit up straight with your back arched and pressed against the PostureProp and the exercise cables positioned under your arms. Hands at your shoulders (fig. A), press forward and upward at around a 45-degree angle (fig. B). When your arms are fully extended, return them slowly to your shoulders. 8 to 15 reps. Seated Bicep Curl: As the title says, this exercise works your biceps. Sitting upright and pressed against the PostureProp, place your arms above your knees (fig. A). Ensure your body is stable then bend your elbow (fig. B). Keeping your palms up and wrists strong. Lower your arms under control back to your knees keeping resistance on your biceps. 8 to 15 repetitions. Seated Ab Crunch: Works your abdominal muscles. Using the upper Resistance Anchor Cable™ exercise cables extended over your shoulders, pull the two handles together and interlock your fingers in front of your chest (fig. A). Bending at your waist, using the cables as resistance (fig. B), isolating your stomach muscles. Repeat this for 10 to 15 times. Seated Lateral Raises: Works your shoulder muscles. As always, sit straight pressing your back against the PostureProp. Start with your arms at your sides (fig. A), raise them and keep your elbows straight without locking them (fig. B). With palms facing down and using a controlled movement, return your arms slowly to your sides. 8 to 15 repetitions. 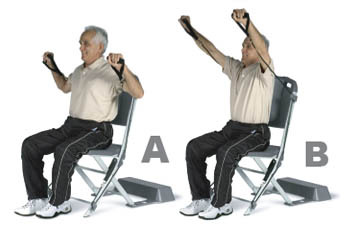 Seated Front Raises: (shoulders) This exercise begins in the same position as in the Lateral Raise (fig. A), with both arms down at your sides and your back upright. Pull the cables up, keeping your arms extended straight out in front of you (fig. B). Bring your arms up as high as possible and very slowly return to the starting position while maintaining resistance on the return portion of the exercise. Repeat 8 to 15 times and remember to keep your back straight. 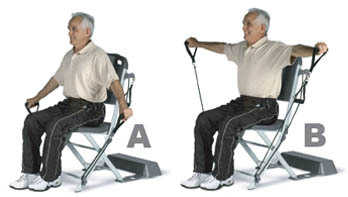 Seated Tricep Extension: This exercise works your triceps. Sitting up straight, bend your arms so your elbows are pointing up (fig. A). Next extend your arms while keeping your elbows in position. (fig. B). Moving your hand slowly back to the starting position repeat this for 8 to 15 repetitions. 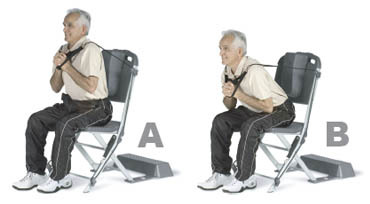 Seated Bent over Row: Works your back and shoulders. 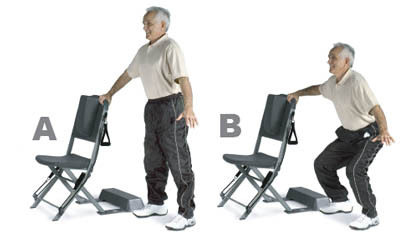 Beginning by bending over, support yourself with one hand and one knee on the chair seat (fig. A). 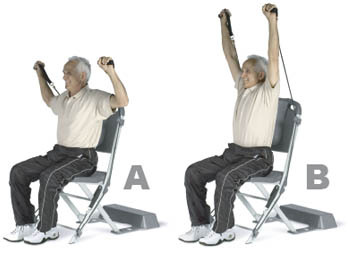 Pulling straight up on the lower cable until your hand is close to your chest (fig. B). Keeping your torso still and solid try not to jerk. 8 to 15 repetitions with each arm. 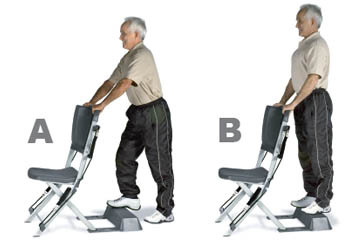 Knee Bend (squat): (thighs) Stand at one side of the chair and use the Balance Bar for stability (fig. A). Bending at your knees – squat down. Keep your upper body upright and relatively perpendicular. (fig. B). Slowly raise your body back into the fully upright position. Repeat 8 to 15 times. Front Step : Works your thighs and calves. make sure the Health Step™ is locked into place and stand behind the chair. Placing your hands on the Balance Bar step up. (fig. A), then step up with your other foot (fig. B). Then step down with your one foot, then your other. Repeat 8 to 15 times with each leg. Remember to alternate legs. Side Step: Works your thighs and abdominal obliques. 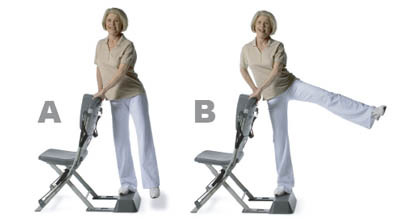 Standing sideways on the the Health Step™ Step steadily hold on to the Balance Bar (fig. A). Raise one leg slowly (fig. B) and then slowly lower it back to the starting position. Do 8 to 12 reps on one side then turn to the other side and repeat. See more about the Resistance Chair System.